Thomas Hopperhttps://tomhopper.wordpress.com/I'm product development leader, engineering manager, Six Sigma Black Belt and scientist. My experience in new technology and product development has taught me the value and role of learning in RD&E. Those of us working in industry with Excel are familiar with scatter plots, line graphs, bar charts, pie charts and maybe a couple of other graph types. Some of us have occasionally used the Analysis Pack to create histograms that don’t update when our data changes (though there is a way to make dynamic histograms in Excel; perhaps I’ll cover this in another blog post). One of the most important steps in data analysis is to just look at the data. What does the data look like? When we have time-dependent data, we can lay it out as a time-series or, better still, as a control chart (a.k.a. “natural process behavior chart”). Sometimes we just want to see how the data looks as a group. Maybe we want to look at the product weight or the cycle time across production shifts. 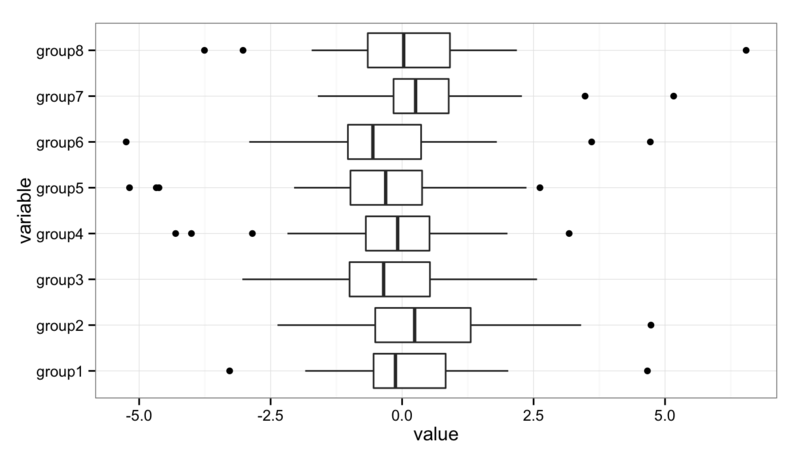 Unless you have Minitab, R or another good data analysis tool at your disposal, you have probably never used—maybe never heard of—boxplots. That’s unfortunate, because boxplots should be one of the “go-to” tools in your data analysis tool belt. It’s a real oversight that Excel doesn’t provide a good way to create them. 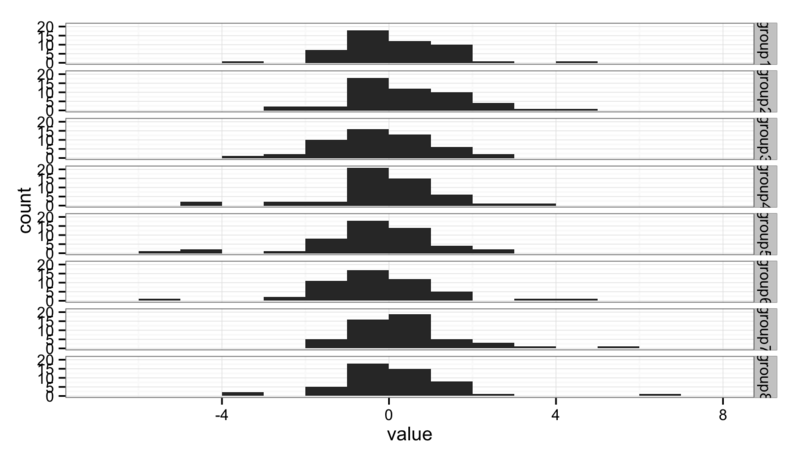 Either the histograms need to be taller, making the stack too tall to fit on a page, or we need a better solution. 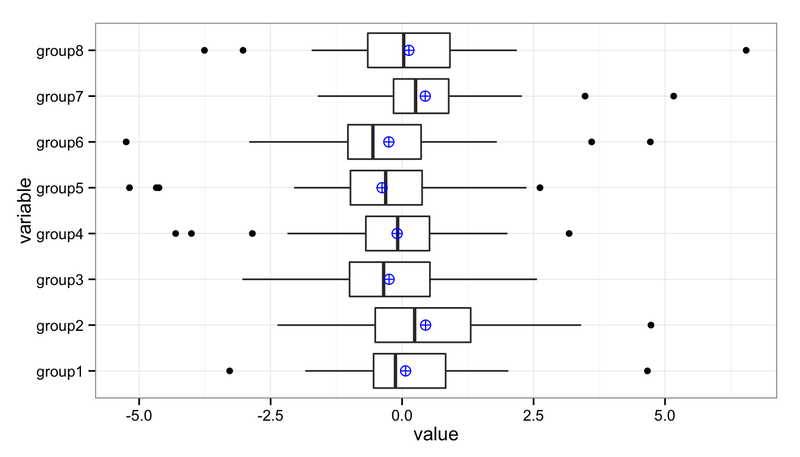 The boxplot provides a nice, compact representation of the distribution of a set of data, and makes it easy to compare across a large number of groups. A measure of the central tendency of the data that is a little more robust than the mean (or arithmetic average). Half (50%) of the data falls below this mark. The other half falls above it. Twenty-five percent (25%) of the data falls below this mark. Seventy-five percent (75%) of the data falls below this mark. The middle half (50%) of the data falls within this band, drawn between the 25th percentile and 75th percentile hinges. 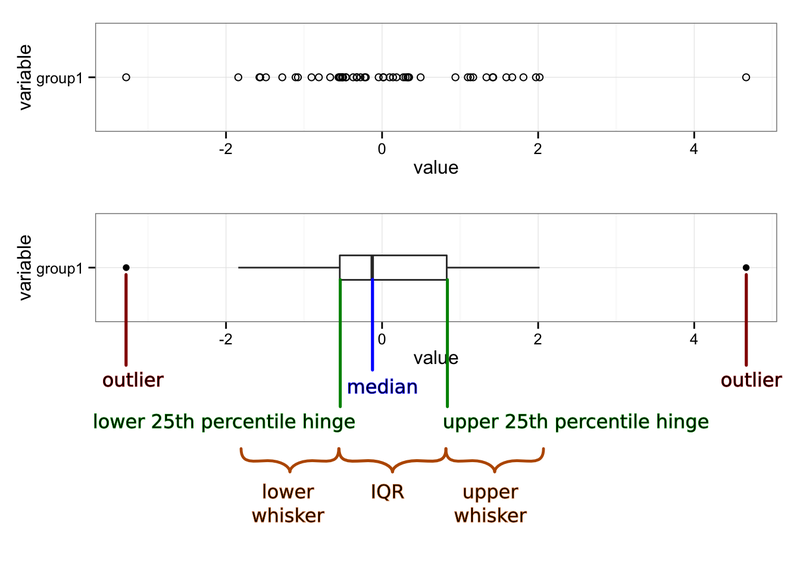 The lower whisker connects the first quartile hinge to the lowest data point within 1.5 * IQR of the hinge. The upper whisker connects the third quartile hinge to the highest data point within 1.5 * IQR of the hinge. Any data points below 1.5 * IQR of the first quartile hinge, or above 1.5 * IQR of the third quartile hinge, are marked individually as outliers. Graphs created in the R programming language using the ggplot2 and gridExtra packages. Computing, Vienna, Austria. URL http://www.R-project.org/. Baptiste Auguie (2012). gridExtra: functions in Grid graphics. R package version 0.9.1. Setting product specifications is an iterative and challenging process, combining lab test data, historical data and educated guesses. All too often, the result is a set of product and process specifications that must be changed to meet manufacturing needs and that do not meet all customer requirements. To achieve specifications that are correct and defendable, the engineer must understand how the voice of the customer and the voice of the process interact, and must fully specify product through both specification limits (also called tolerance limits) and production capability, or Cpk. What the customer expects a product to do—what they are willing to pay for—is known as the “voice of the customer” (VoC). A customer’s expectations may not all be written or explicitly stated, and unwritten or unrecognized needs or wants can be even more important than the written ones. As we design a product, we first translate the VoC to engineering requirements and then flow the requirements down to subcomponents. For simplicity, I will adopt the convention of referring to the specifications or tolerances as the Target Specification, the Upper Specification Limit (USL) and the Lower Specification Limit (LSL). The target, USL and LSL are the engineering translation of the VoC. I will refer to the measure being specified—length, mass, voltage, etc.—as a characteristic. What we know about the parts actually produced—maximum and minimum, average, standard deviation, outliers, etc.—is known as the “voice of the process” (VoP). The VoP tells us the limits of our manufacturing abilities. Suppose that we know from the production plant that the typical weight of our product is between 99.2 and 104.2 kg. This is the VoP; it may or may not be acceptable to the customer or fit within the USL and LSL. When we engage in statistical process control (SPC), we are listening to the VoP, but not the VoC. The engineer must design to the VoC while considering the VoP. The desired value of the characteristic. The average of the upper and lower specification values—the value in the middle of the specification or tolerance range. Used in different ways. May mean the target value of the specification. Sometimes the value printed in marketing literature or on the product, which may be the minimum or some other value. The maximum allowed value of the characteristic. Sometimes referred to as the upper tolerance. The minimum allowed value of the characteristic. Also referred to the lower tolerance. Suppose that the customer has said that they want our product to weigh at least 100 kg. Since the customer will always want to pay as little as possible, a customer-specified lower specification limit of 100 kg is equivalent to saying that they are only willing to pay for 100 kg worth of costs; any extra material is added cost that reduces our profit margin. If the customer does not specify a maximum weight, or upper specification limit, then we can choose the upper limit by the maximum extra material cost we want to bear. For this example, we decide that we are willing to absorb up to 5% additional cost. For our product, material and construction contributes 50% to the total assembled part cost, so the USL on weight is 110 kg. Defect rates are expressed variously as Sigma, Cpk (“process capability”), Ppk (“process performance”), parts per million (ppm), yield (usually as a percent) or defects per million opportunities (DPMO). “Sigma” refers to the number of standard deviations that fit between the tolerance limits and the process mean. A 1-Sigma process has 1 standard deviation ( ) between the mean ( ) and the nearest specification limit. Cpk is a measure of the number of times that three standard deviations ( ) fit between the mean and the nearest specification limit. Cpk is often used by customers, especially automotive OEMs. We can easily convert between Cpk, Sigma yield, ppm and DPMO. Production tells us that historically, they usually see a range of about 5 kg in assembled part weight, with weights between 99.2 kg and 104.2 kg. With enough data, the range of observed data will cover roughly the range from [mean – 3 standard devations] to [mean + 3 standard devations], so this gives us kg and kg. From , , we have a 2-Sigma process. With this data, we could estimate the percent of parts that will be below the LSL. We can use this data to estimate the percent of product that will be out of the customer’s specification. We’ll assume that our process produces parts where the weight is normally distributed (having a Gaussian or bell-shaped curve). This is read as: the probability of seeing a weight X less than or equal to the given value x = 100 is 0.02, so we can expect about 2% of parts to be out of specification. This can also be done in Excel using NORMDIST(100, 101.7, 0.83, TRUE) or, in Excel 2010 and later, NORM.DIST(100, 101.7, 0.83, TRUE). In R we would use pnorm(100, 101.7, 0.83). Minitab can also display this graphically. Open the “Graph” menu, select “Probability Distribution Plot…” Select “View Probability” (the right-most option) and click “OK,” On the “Distribution” tab, select “Normal” from the distribution menu and enter “101.7” for the mean and “0.83” for the standard deviation. 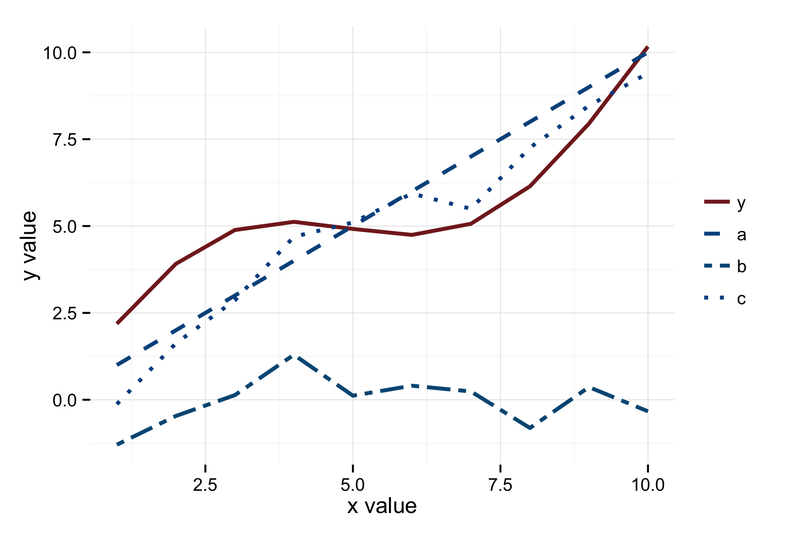 Then switch to the “Shaded Area” tab, select “X Value,” “Left Tail” and enter “100” for the “X value.” Click on “OK” to obtain a plot like that below. Probability density distribution showing cumulative probability below a target value of 100 shaded in red. Of course, not all processes produce parts that are normally distributed, and you can use a distribution that fits your data. 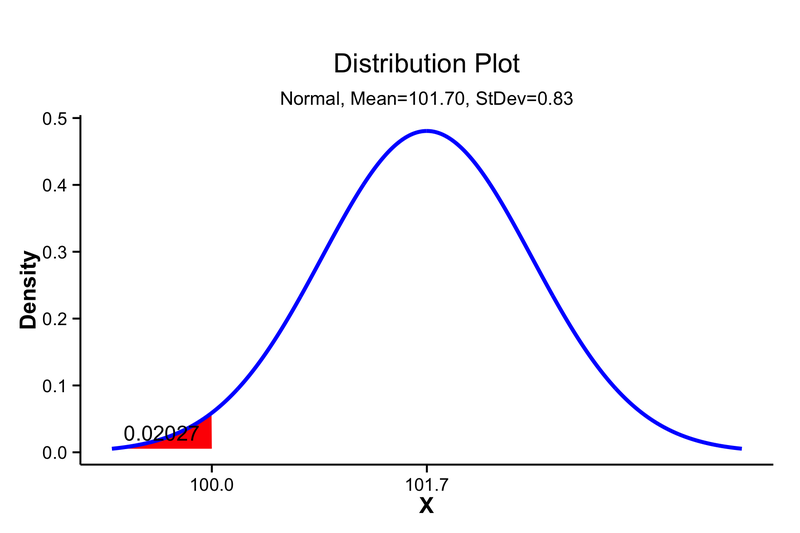 However, a normal distribution will give you a good approximation in most circumstances. which is often a convenient form to use to estimate the “best case” process capability, even when we do not know what is. The combination of VoC-derived specification limits (USL, LSL and T) with process data ( and ) ties together the VoC and the VoP, and allows us to predict future performance against the requirements. 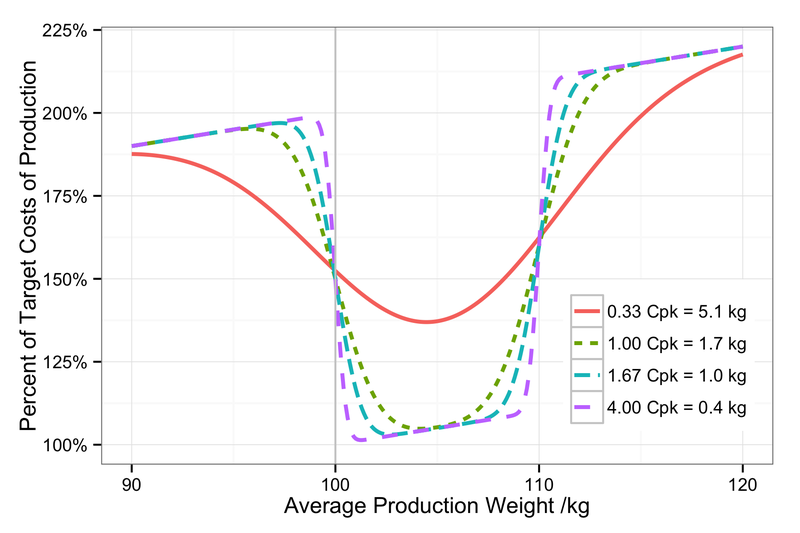 Multiplying Cp or Cpk by produces a measure of the process capability that includes centering on the target value, T, referred to as Cpm or Cpkm, respectively. These versions are more informative but much less commonly used than Cp and Cpk. Acceptable values of Cpk are usually 1.33, 1.67 or 2.0. Automotive OEMs typically require Cpk = 1.33 for non-critical or new production processes, and Cpk = 1.67 or 2.0 for regular production. In safety-critical systems, a Cpk should be 6 or higher. The “Six Sigma” improvement methodology and Design For Six Sigma refers to reducing process variation until six standard deviations of variation fit between the mean and the nearest tolerance (i.e. Cpk = 2), achieving a defect rate of less than 3.4 per million opportunities. Some typical Cpk, and corresponding process sigma and process yield are provided in table [tblCpkSigmaYield]. In the table, “Yield (max)” assumes that the process is perfectly stable, such that parts produced today and parts produced weeks from now all exhibit the same mean and variance. Since no manufacturing process is perfectly stable, “Yield (likely)” assumes additional sources of variation that shift the process by (e.g. seasonal effects, or differences in setups across days or shifts). This shift is a standard assumption in such calculations when we do not have real data about the long-term process stability of our processes. they result in lost customers (reduced revenue without reducing “fixed” costs). For example, underweight or damaged injection-molded plastics might be melted and reprocessed, but this adds cost in capital for the added equipment to proces the parts and cost for extra electricity and labor to move, sort and remelt. Later in production, defective parts will have to be scrapped. We can see, then, that a cost function can be associated with each end of a specification range. The specification limits must be derived from the VoC, but the VoP imposes the cost function. The figures below illustrate this for both one-sided and two-sided specifications. The minimum of the cost function is a good place to set our target specification, unless we have some strong need to set a different target. Since the given is the maximum allowed for the assembled part to meet the desired Cpk, this means that the component variances, , are an estimate for the maximum allowed component variance. Manufacturing can produce parts better than this specification, but any greater variance will drive the parent part out of specification. Very often, only specification ranges (or tolerances)—the USL and LSL—are provided by engineering when designing parts. Almost as often, these ranges are based on a target value (derived from the VoC) with some “allowed” tolerance based on what manufacturing says they can achieve on the existing equipment and processes (the VoP). It should be clear from the above that a minimally-adequate part specification includes USL and LSL derived from the VoC and the minimum acceptable Cpk derived from both the VoC and the VoP. 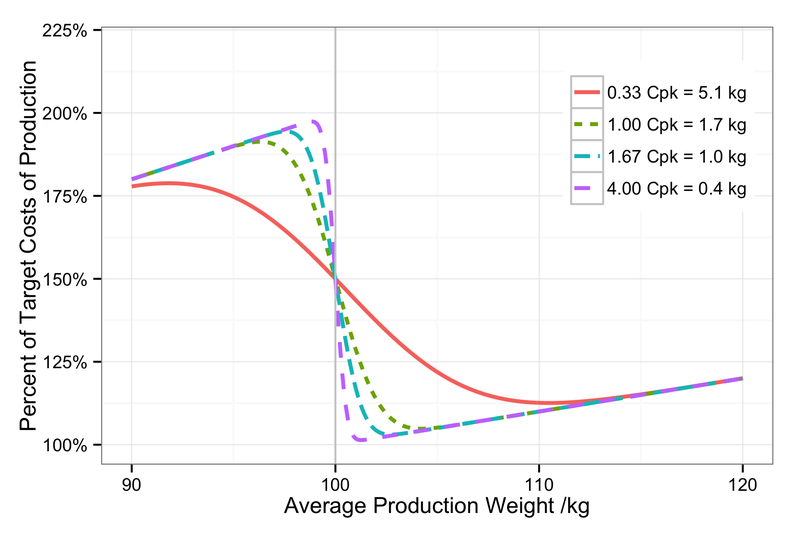 The inclusion of the minimum process capability is the only way to ensure that the parts are made within the target costs and at the target quality level. The next challenge is to flow these requirements down to the components. Having laid the groundwork for the basis of requirements flow-down, I will look at a way to do this in a future post. All graphs created in R using ggplot2.